More children across the country met the expected standard at the end of primary school this summer in English and mathematics, amid rising education standards in England, Minister for School Standards Nick Gibb announced today (Tuesday 10 July). • 78 per cent met the expected standard in grammar, punctuation and spelling, up 1 percentage point on last year. "A good primary education lays the foundations for success at secondary school and beyond. That’s why we introduced a more rigorous, knowledge-rich primary school curriculum – with an emphasis on reading and fluency in arithmetic – to ensure every child is helped to reach their potential from the moment they start school. "Today’s results and the rising standards we are seeing in our primary schools are the fruit of our reforms and a tribute to the hard work and dedication of teachers across the country. These reforms promise even more success in the years to come and will help to improve education for every child, no matter their background." The government has invested in programmes to help raise standards in our primary schools, including a £26 million network of specialist English Hubs around the country to improve pupils’ literacy and £41 million to follow the same approach to teaching maths as world leading countries through the Shanghai Mastery for Maths programme. 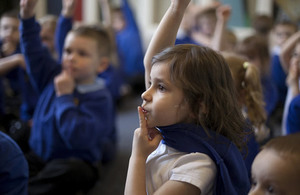 ‎This is on top of wider changes to the primary assessment system which will reduce unnecessary workload for teachers so they can focus on what really matters in the classroom. Today’s figures build on the record 1.9 million more children now in good or outstanding schools than in 2010. The government is continuing to ensure all parents have a good school place on their doorstep, with the recent announcement of £680million to create 40,000 more good school places in primary and secondary schools. Since 2010, 825,000 new school places have been created, with recent analysis showing 91 per cent of those in 2016-17 were in good or outstanding schools.